I've gotten an AS5040 10-bit magnetic rotary encoder, and an AS5045 12-bit, working, checking all the non-programmed interfaces. Both can be one-time programmed to output different code schemes, but they're not very useful for what I need so I'm not messing with them. 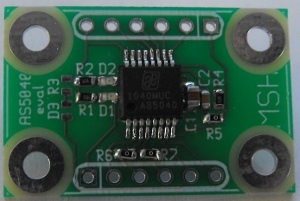 In both cases I piggybacked the chip/breakout board off an Arduino, using the 3.3v supply. I rather randomly chose to use pins 2, 6, and 7 of the Arduino for the digital input: 6 is a chip select that also signals the start of an interface round, 7 acts as the clock from the Arduino to the chip, and 2 acts as the data transfer from the chip to the Arduino. These are trivially remapped. The code includes a debug setting that'll print out any faults the AS504x notices, but if you turn off the debug setting you'll just get degrees out. It reads from the chip and transmits to the host computer roughly once a second. If anyone wants I've also written a sketch using delaymicroseconds() to get info about 10,000 times faster than that, which I'd be glad to post. angle = packeddata & anglemask; // mask rightmost 6 digits of packeddata to zero, into angle. Serial.print("angle: "); // and, finally, print it. //Serial.print("raw: "); // this was the prefix for the bit-by-bit diag output inside the loop. OCF = statusbits & 32; // this is 1 when the chip startup is finished. Last edited by john on Mon Dec 13, 2010 11:52 pm, edited 1 time in total. Here's the AS5040 code -- pretty much the same, with some changes in variable declarations and some math changes that reflect the 5040's 16-bit word vs. the 5045's 18-bit word. I'm trying out some formatting and color games, so I hope this code snippet looks better than the last one. Last edited by john on Mon Dec 13, 2010 11:53 pm, edited 1 time in total. And, finally, here's a link to a video of me trying the AS5040 board out:http://www.youtube.com/watch?v=gXewDdlUT_Q. It shows the analog PWM-out signal, the A/B quadrature output, and the results of the digital output dumped to a terminal. It works fine on both HyperTerm and minicom as long as they're set to 9600 8N1. john wrote: If anyone wants I've also written a sketch using delaymicroseconds() to get info about 10,000 times faster than that, which I'd be glad to post. I'd love to see that if you can post it! Note that because of some issues with word length, the AS5040 works both straight and in debug mode (where it displays errors like the magnet being too far away) while the AS5045 works fine when it's not in debug mode but in debug mode gives the right angle and the right error codes but detects an error with every reading, even if there isn't actually an error. I haven't gotten around to fixing that, since it does work in normal mode. This is the version for the 5040. If you want to use the 5045 instead you need to change the anglemask value, make x go to < 18, and a couple other minor changes that should be obvious from the previously posted '45 code. I'm going to do some experimenting to see if I can make the delay between the 18-bit readings even shorter. Initially, before you posted this code, I tried removing the delays between bit readings but I suppose that might sometimes re-read the same information (although the numbers seemed correct?). I'm trying to cram readings from 6 devices every 2 milliseconds, with a little time to spare to do some PID calculations. I'm open to daisy-chaining 2 sets of 3 encoders together. That being said, have you looked into the digitalWriteFast library? (http://code.google.com/p/digitalwritefast/) It supposedly speeds up digital reading and writing significantly if you know the pin assignments at compile time. I would appreciate your input on this as it would be nice to know if I'm expecting to do too much in too little time (2 milliseconds)! Also, with the '45 have you experienced much "bounce"? I'm currently in the process of building some sort of LEGO thing like you did to keep things steady but if I just sit the magnet on top of the device and let the readings happen there seems to be a lot of variance every sample (+/- 15 around some center point). I'll look at the fast write library. I was under the impression that the code I posted was getting close to the limits of the Arduino's clock speed, but I'm nothing like an expert at this. As for bounce -- I've had varied experiences. The board is mostly output stuff; the only component that affects the chip stability is the capacitor between the 3.3v pin and ground. (and I use an X7R-rated cap in that location.) I can't claim the board design is perfect, but I can't see how anything other than that cap could result in a problem with readings. That makes me think that problems are either in the chip, or external noise of some type. (Though it's not clear how a chip that detects magnetic fields is going to get confused by noise.) It's also possible there's some weird timing issue with my code and the Arduino's clock frequency, so every once in a while it drops a bit. Do you see glitches if you run the original one-sample-a-second code for a couple hours? If I had a bit more time it'd be useful to cross-compile the code into AVR assembly and run that, to cancel out any problems stemming from the compiler in the guts of the Arduino IDE. Using the digitalWriteFast library I was able to set shortDelay to 2 microseconds for everything (I removed the longDelay delay from the code and replaced it with delayMicroseconds(shortDelay). When I get the chance I will try 1 microseconds. I haven't had any problems thus far. I am using the encoder to modify an existing standard servo for a motion control application. The readings on the '45 have been great (I exchanged the one I was having trouble with) and I have a PID control loop going that keeps the rotation of the motor in any position I specify. I'll post a video of it once I have the other servos modified. Hi John, I hope you are still active here. I want to use AS5045 with arduino uno 3. Can you please tell me how to connect as5045 with uno 3 ? I want to know which pins go where ? Also i saw the video. You are movin encoder forward and backword. I want to rotate the motor shaft to get its position/angle. Please tell me what changes i have to make in your code ? Thanks. uint8_t OCF = encoder_value & (1 << 5); // this is 1 when the chip startup is finished.